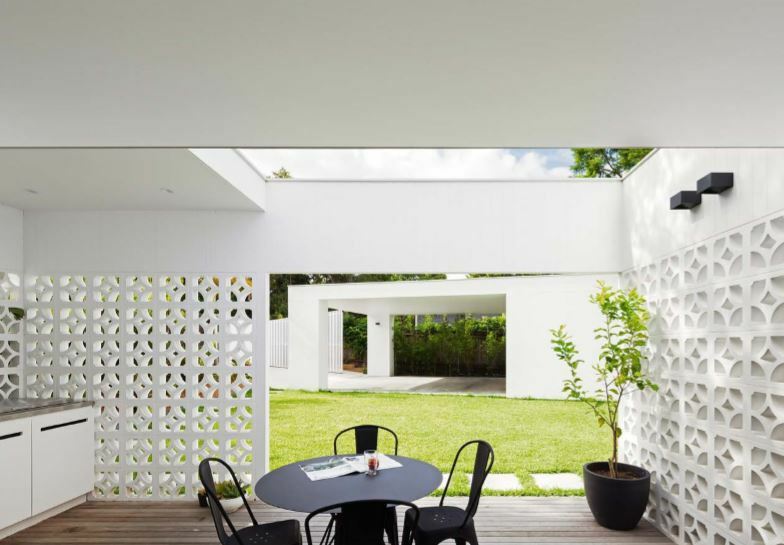 A 1950s red-brick home in Sydney’s suburban lower north shore has been upgraded with an all-white extension, a series of breeze-block-screened, uncovered outdoor rooms, designed by architecture firm Architect Prineas. 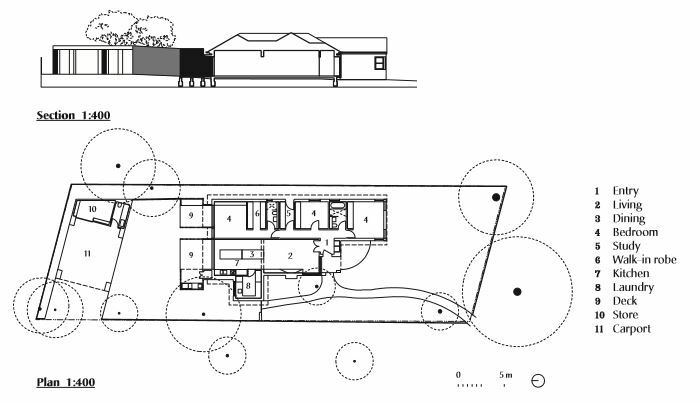 The existing house was solid and well-built but perhaps a little dark, the changes while discrete appear transformative. Breeze blocks are a decorative concrete block used for architectural screen walls and fences and there is no doubt they are making a comeback. They have been around since the 1930s and became very popular in the Mid Century Modern residential and commercial buildings of the 1950s and 1960s. They are typically made from the ashes of coal, bonded together by cement and used especially for walls that bear relatively light loads. They are a perfectly appropriate utilitarian material to be used to create outdoor spaces, suitable for the Australian climate. 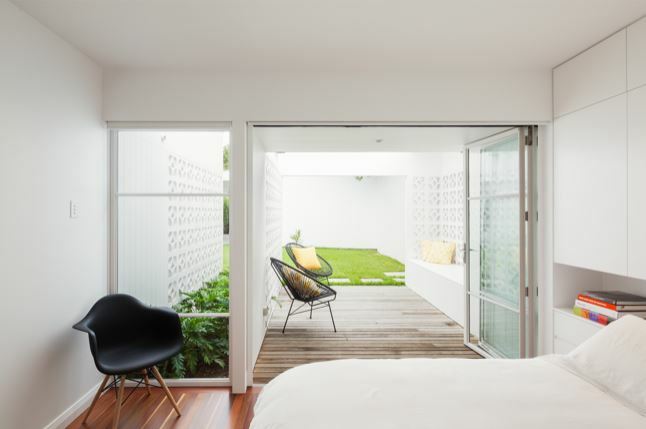 In this case, the owners did love the existing house, however they required a reconfiguration of the internal spaces and an improved connection to the garden. While their brief was for an additional contained courtyard area flowing on from the kitchen, they did not want the extension to feel too large. Their wishlist included reasonably sized bedrooms, storage, an outdoor barbecue and wok burner and a double carport. Prineas’ solution was to stay within the original footprint, simplifying and reconfiguring internal spaces. Using an existing north-south running central corridor, all bedrooms and bathrooms were positioned along the eastern elevation, with the master bedroom opening to the rear north-facing garden. On the western elevation, kitchen, living and dining rooms were transformed into one large open-plan space, offering garden views north and south. Ceiling heights were stepped down from front to rear, framing garden views and maximising the sense of containment in each of the three separate zones. Ample storage, cross ventilation and access to natural light was maximised in all areas. Most importantly Prineas added the two rear “outdoor rooms”, or verandahs, to connect the house. One room is connected to the family-living space, the other to the private main bedroom. The use of all white paint throughout (including original cornices, architraves, sills and trims) and sheer light curtains serve to bring increased light into the house. The bathrooms are a modern play on the traditional marble/white tile palette. 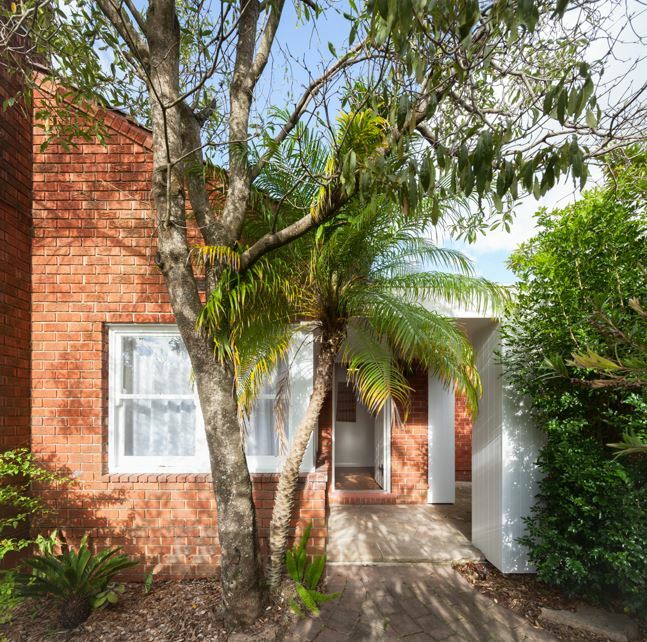 It is so important that we find solutions to update these well built 1950s houses for contemporary life without resorting to demolition. We love this approach which is light and hip, with old materials revisited in a practical appropriate and attractive design.